While reading a Wall Street Journal article there was one line that really caught my attention- “The Big Gym You Never Went To is under siege from The Tiny Gym You Actually Go To” (How Much Will You Pay For That Body? Jason Gay, WSJ). It really made me realize the options today’s consumers have for fitness! Today more than ever before, there are numerous available options to get fit; big box gyms, boutique studios, martial arts centers, cycle studios, barre/yoga/pilates studios, and much more. In America, where nearly 70% of our population is considered overweight, it’s encouraging to see this increase in options! A typical Triplex workout- come check out your first workout FREE! Recently our staff attended the NSCA’s National Convention in Las Vegas, Nevada, and sat in on a lecture entitled The State of the Fitness Studio Industry. 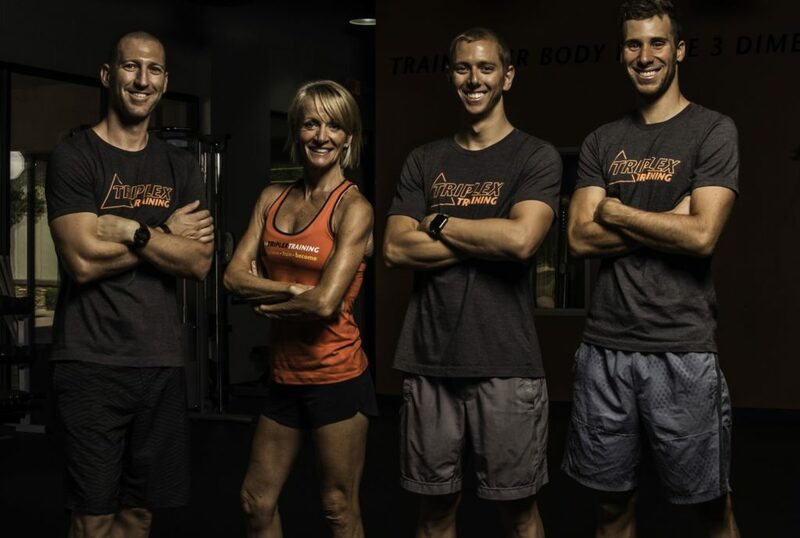 Our Chandler gym (located in the Phoenix valley) kept running while we were away, meanwhile we heard them discuss the amazing growth trend of small group training, specialized fitness, and high intensity training. Our ears perked as we nodded in agreement, hearing terms like accountability, prescription, technique, and community- four foundations we build upon at Triplex Training. Accountability– Each member is an individual project that we are sculpting into perfection. Attendance is taken and recorded, we know their schedule and when they’re not showing up, they’ll hear it. Prescription– Different daily workouts are designed to not only work your entire body in a functional manner, but to keep it interesting and engaging. Get through the door and you’ll be guaranteed to complete a high intensity workout that challenges your strength, cardio, balance, and mobility. Technique– Each exercise is taught every single day. And from the minute you start burning calories we are constantly keeping a professional eye on your form and technique. Dealing with an injury? No problem, we can accommodate to get you back quicker. Community– Suffering next to someone for 60 minutes of burpees, lunges, and push- ups, it’s amazing the friendships that are created. Occasionally we’ll trade in high-fives and fist-bumps for cheers and laughs outside of our facility. The positive energy of those around is infectious. The Crew at Triplex- Coaches Kyle, Susan, Alex, and Malcolm! We know we are competing with so many options for fitness, but we’re sticking to our foundations of accountability, prescription, technique, and community to help build our Chandler gym. We feel the small group workouts of high intensity training are ideal for weight-loss, pain-free living, building strength, enhancing cardio, improving core stability, and much more. Whether we are the right fit for you or not, we know the right option is out there!